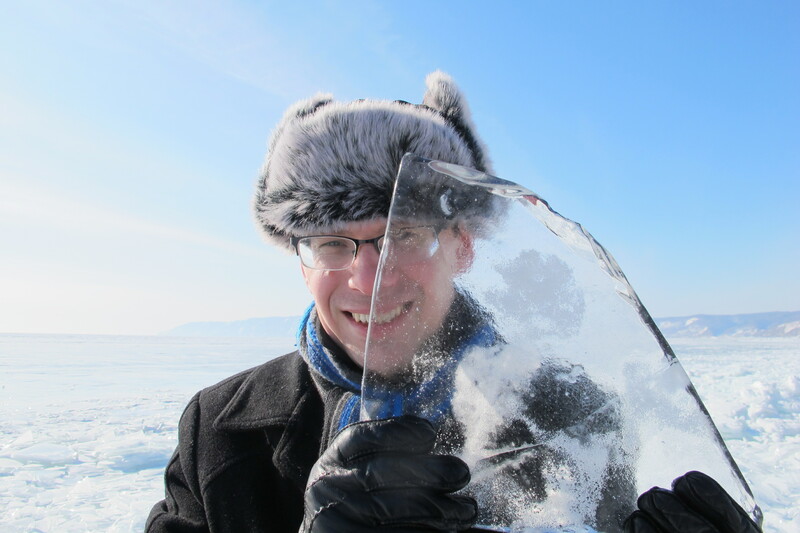 UNI Professor Andrey Petrov hold a piece of Lake Baikal during his recent Siberian visit. Credit: Andrey Petrov. When I contacted Andrey Petrov a week ago, he was returning from the Irkutsk region of Siberia. The University of Northern Iowa geography professor makes frequent visits to Siberia and other similarly remote – and cold – regions, including Canada’s Yukon Territory and northern Russia. This time he was interviewing residents of villages and towns near Lake Baikal about the region’s reindustrialization. In the last century the area had seen an inflow of industry that went bust. Now it’s rising again, thanks to the search for oil. The extreme conditions and isolation are some of the reasons Petrov, a native Russian, returns to places like Irkutsk and Yellowknife. “I’m fascinated with the resilience of people living in difficult conditions,” he says, but the challenges facing Arctic communities go beyond the weather and distance. Those challenges are the subject of a new project Petrov directs. Headquartered at UNI, the five-year program, supported with nearly $750,000 of National Science Foundation money, will knit researchers from multiple institutions around the globe’s northern regions. Their goal: understanding Arctic communities and how they can enhance their development, health and well being while preserving societies and ecosystems. It’s a big job. Five years won’t be enough, Petrov says. Depending on how you draw the borders, somewhere around 4 million people live in Arctic regions, Petrov says. Formally, the project called Arctic-FROST (Arctic Frontiers Of SusTainability: Resources, Societies, Environments and Development in the Changing North) follows geographic boundaries set in the Arctic Human Development Report, a 2002 United Nations-led study. 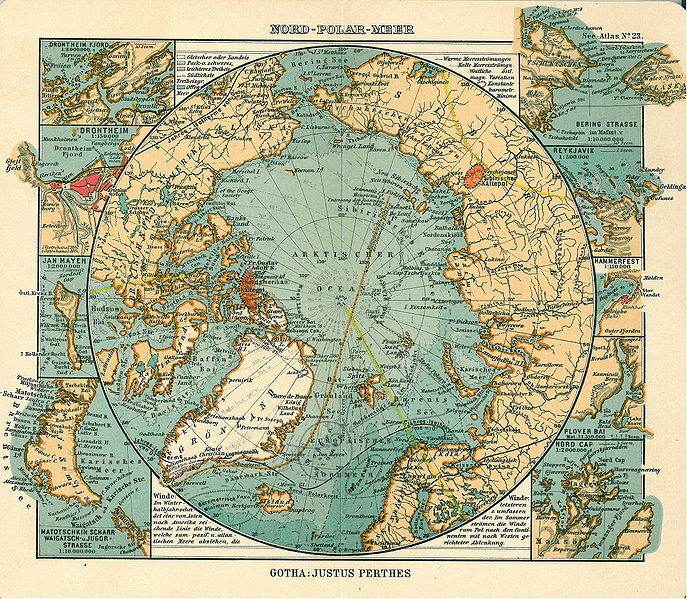 Nord Polar Meer, Justhus Perthes See Atlas 1906 Good map of the Arctic, with inset maps of Drontheim, Drontheim fjord, Jan Mayen, Bering strait, Reykjavik, Hammerfest, Plover Bay, Nordkap, Nowaja zemlja, via Wikimedia Commons. Click to enlarge. This media file is in the public domain in the United States. This applies to U.S. works where the copyright has expired, often because its first publication occurred prior to January 1, 1923. The study will look at Alaska, three Canadian territories, northern Quebec, Iceland, Scandinavia and northern Russia. But it also will include Kamchatka, a chunk of eastern Russia that’s technically subarctic. If they share a common geographic trait, it may be that they all have Arctic Ocean shores. Arctic denizens, as you might expect, resist easy classification. In some regions, particularly Canadian, indigenous natives are the majority. In the Russian north, they’re a minority. Some are poor, some prosperous, but in general Arctic populations face difficult social issues related to poverty and unemployment. “Living conditions can be quite constrained,” Petrov says, with poor housing typical because it’s so hard to build in the harsh weather. Arctic regions often are rich in mineral and petroleum resources, but residents don’t always share the wealth. Petrov’s Irkutsk trip – unrelated to Arctic-FROST – was to see whether towns and villages are benefitting from nearby oil field development. Climate change threatens that Arctic lifestyle. “Places are being washed away because of changes in the ocean and permafrost,” Petrov adds, but there are other perils, too. 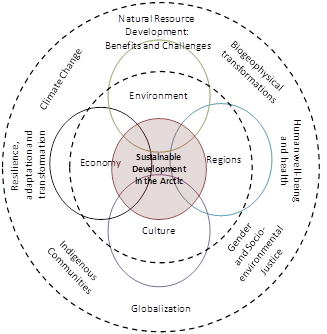 Economic and cultural globalization and drastic social change are weakening distinct Arctic communities. Unemployment, suicide, homicide and domestic violence are chronic issues. Arctic-FROST will examine all aspects of sustainability, Petrov says, including the development, health, and well being of communities in the region, while conserving their ecosystems and resources under climate change. An idea of the subjects and interactions Arctic-FROST will probe. From the project website. The first goal is to coordinate a network of scientists around the Arctic. Arctic-FROST co-investigators with Petrov include geographers Jessica Graybill of Colgate University and Timothy Heleniak at the University of Maryland, and anthropologist Peter Schweitzer, professor emeritus at the University of Alaska at Fairbanks, now at Austria’s University of Vienna. Other researchers are based in northern British Columbia, Iceland, Sweden, Denmark and Russia. Arctic-FROST also has representatives from Arctic communities on its steering committee and in the research network, Petrov says. The team plans two community workshops, one in Alaska and one in Russia, to share its findings, and plans to incorporate educational activities. Later, it will stage an Arctic sustainability forum in Alaska. Petrov, a native of St. Petersburg (only 600 km south of the Arctic Circle), is a main reason UNI is the project’s lead institution. He runs the Arctic Social and Environmental Systems Research (ARCSES) Laboratory in the university’s College of Social and Behavioral Sciences. Other Arctic research at UNI has studied climate change’s impact on wildfires and caribou migration and the role of the creative class and capital in the region. Petrov first came to UNI as a master’s student. He returned after finishing his doctorate at the University of Toronto. Iowa shares some common issues with Arctic regions, Petrov says, including declining population, climate change, and transportation. One of his personal goals is to raise Iowans’ awareness of the state’s connections to the region whenever he can. “After this winter, it should be much easier to do,” he says.